Sylvia Scarlett concerns the sensitive title character (Kate) who’s saddled with a dopey father, a recent widower who also gambled away money he “borrowed” from his company. The two leave their home in France and head for England, with Sylvia disguised as “Sylvester Scarlett” to avoid capture by the authorities. They meet Cary Grant—who steals every scene he’s in—and form a traveling entertainment troupe after their initial con game doesn’t meet with goodhearted Sylvia’s approval. 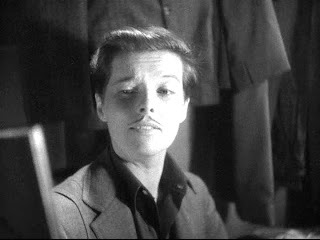 Sylvia Scarlett is the semi-legendary cult movie known for two things: It’s the film where Cary Grant “discovered his Cary Grantness”, and it’s Katharine Hepburn disguising herself as a boy. So is this a comedy or drama, or a mixture of both? Director George Cukor worked wonders with the comedy/drama mixture in both Holiday and The Philadelphia Story, but with Sylvia Scarlett even Cukor’s considerable powers can’t keep the movie from floundering, despite some fine comedic moments from Hepburn and Grant. The review here mainly concerns the film itself, as Hepburn is just fine but there’s just not that much for her to do except look androgynous. The main problem with the film is that it never settles on a tone. It veers from melodrama to comedy and back again. I get the feeling that director George Cukor tried to blend the serious drama (of the novel?) 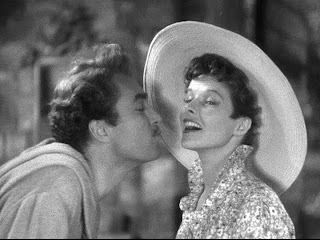 with the more amusing antics seen between Hepburn and Grant but could never find a consistent tone. The story is promising, but takes two steps back for every one step forward. There are also some ineffective supporting actors, especially the Maudie character, played by Dennie Moore (no relation to an untalented actress from another generation, Demi Moore) who’s supposed to have a cockney accent but instead sounds like Edith Bunker; she’s just awful. The movie also boasts a rare cruddy music score by RKO stalwart Roy Webb, who was uninspired enough to spackle the film with a cloying theme that stays in your head long after the movie ends; it plays over the DVD menu, so beware. Katharine Hepburn’s performance is her usual effective self but even her characterization loses steam when she’s not in “Sylvester Scarlett” mode! As Sylvester, she’s tough and gutsy, showing a strength that vanishes when she reverts back to being Sylvia. The ultra-feminine Sylvia is a morose crybaby, weak and pathetic and who’s never developed as well as her “boy alter ego” is. It’s difficult not to sound like Freud when discussing this movie. I’m not sure if Hepburn’s character differences were intended, but since the movie is an unfocused melodrama that lacks a decent script, effective editing, and a huge missed opportunity to play up the gender roles for comedic purposes. So while Hepburn is quite good in this, the movie has earned its longstanding reputation as an intriguing failure; even though it never truly delivers the dramatic and comedic potential of the gender bending that Sylvia Scarlett is (barely) remembered for. Some unknown and rather unsuccessful 30s films please me much more than certain hits. I'm about to fill the last gaps in my Jean Arthur since-1935-collection these days. And so several (in the 30s) unsuccessful films came in. Most of those classical flops are pleasing me very much. I was happy like a child. Just watched this last night. 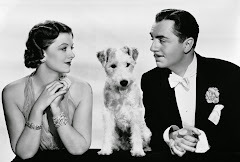 Maudie's accent was prototypical "floozy" characterization; a simplistic and stereotypical lack of discretion being the only suitable justification at the time for her attraction to Hepburn's "Sylvester."